In reality, why they liked the verse was that it reminded them of the joy of God. And while Nehemiah 8:10 clearly states, “The joy of the Lord is my strength," spelling Nehemiah can be tricky, so we would have to buy all variant-spelling domain names, including "KneeOhMyAh810 dot com." But mark511.com is very easy to spell and remember! 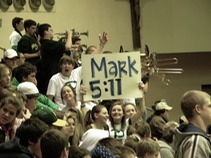 So if the Joy of God is an important part of your faith, consider yourself a part of Mark 5:11 Ministries. And help us spread the joy!